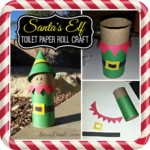 Despicable Me Minion Toilet Paper Roll Craft– Here is a super cute craft for kids by turning recycled empty toilet paper rolls into a tiny minion! All you need is paper, glue, scissors, bottle cap, and a black marker. Funny Toilet Paper Minions – Here’s another example of some minions but these are much simpler than the last one. All you need is an empty toilet paper roll, black paper, black marker, and a BIG google eye! Haha this one is funny to me because thats what their eyes actually look like through their lenses. Despicable Me Minion Water Bottle Covers– This is an easy and inexpensive project to make for birthday parties or just for fun! Cover your water bottles with minion faces! 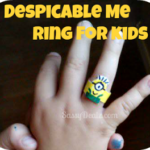 Despicable Me Party Box Favors – Wow! I love these little boxes. The lady found the template ones at the dollar store and created some cute minions with eyes out of them. I think these would be perfect for kids birthday parties but she used them as bridal shower favors. DIY Despicable Me Bowling Pins – These are genius! 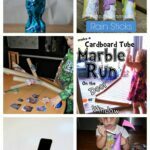 If you have old 2 liter soda bottles laying around grab them to make a fun game for the kiddos! All you need is the bottle, a printable template that she provided, and paint! I love the fact that you can use a squirt gun to try to knock them over just like in the movie. Free Despicable Me Coloring Pages – Here are some printable coloring sheets for you and your kids to use! DIY Minion Bookmark– This is so funny. You can make your own despicable me bookmark where it looks like one of the minions is eating the page! 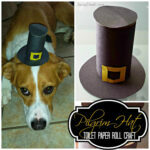 Monster Dog Craft– This craft looks like its made out of paper plates or gray paper which i’m sure you could do too. It looks like the dog from Despicable Me hehe! DIY Kids Minions Hat – Wow! This looks so easy to do I think your kids would love it. Some children made their own despicable me hats out of just a regular yellow beanie, black pipe cleaners, a cut up toilet paper roll, and some fabric or stretchy string. Despicable Me Treat Bags – These are super cute and can be customized to your children’s names! It looks like she used some cut outs and white paper bags to use for popcorn or party favors! 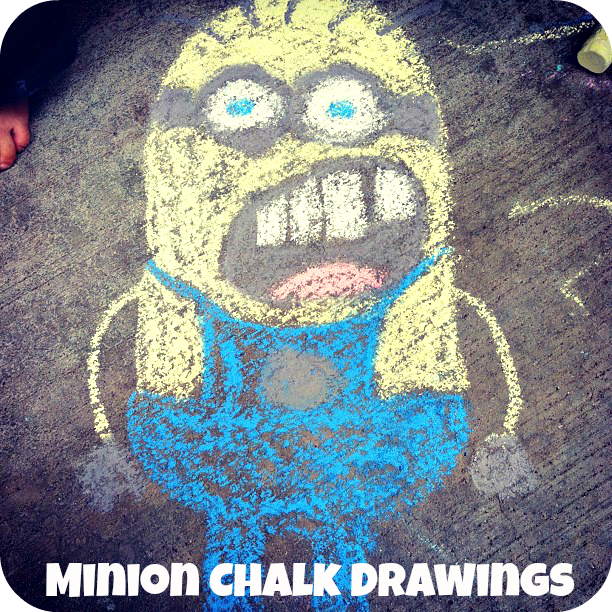 Minion Chalk Drawings– This is a great idea that I got from a friend! 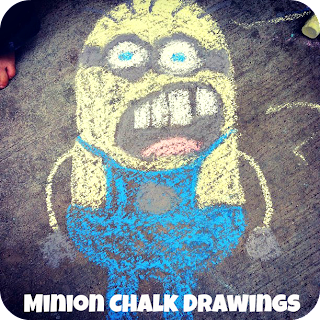 Use your imagination with yellow, blue, white, and gray chalk with the kiddos! This is definitely one of the cheapest activities you could do! Despicable Me Minions Party Hats – Cute! All you need is to buy some yellow visors, black foam paper, big google eyes, and black pipe cleaners. 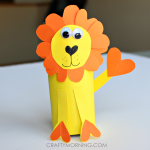 These look super fun to make with kids. 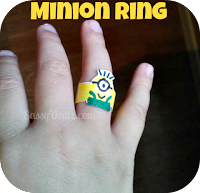 Despicable Me Minion Ring– If your child loves to wear rings or need a birthday party craft, this one is perfect! Literally all you need for the main supplies are paper and markers! Minion Finger Puppets Made From Gloves– This is so creative! To make some cheap despicable me finger puppets all you need is some dollar yellow kitchen gloves and a black sharpie. Just cut the finger parts off and draw on faces, so cool! Despicable Me 2’s Box of Shame – This cracks me up! If you have a cardboard box laying around in the garage, drag it out and cut a square out. Write “Box of Shame” in marker and let the kiddos play, great for birthday parties! 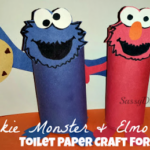 Minion Toilet Paper Roll Craft– This is an easy craft to do and all you need is a toilet paper roll, yellow & blue paper, part of an egg carton, black marker, and a pipe cleaner. Here you can view what the cute little guy looks like. Despicable Me Minion Bracelet– Here is a cheap craft for the kiddos. 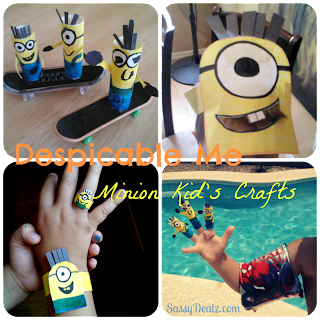 All you need is paper, markers, and tape to make fun little minion bracelet for boys and girls. Great for parties! Minion Balloon Faces– Here’s a fun craft for any age! 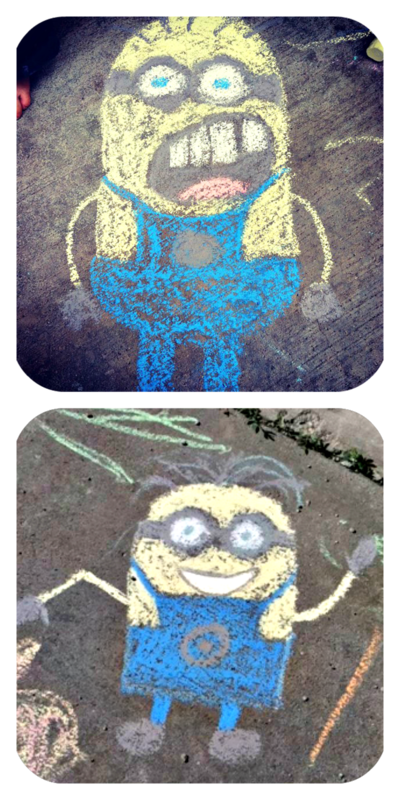 All you need is yellow balloons, a black sharpie and some printables of the minions eyes/glasses to tape on. Minion Hama Bead Keychain – These are so cool and fun to make! I love hama beads and it’s a great activity for children to improve their motor skills. Make one into a key chain or just let the kiddos play with them. 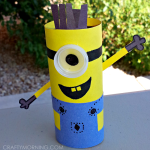 Make Your Own Halloween Minion – This craft is super simple but can be fun. Just get yellow and black paper and let your kids imagination run wild with what they want their little minion to wear for a costume! Despicable Me Minions Nail Tutorial– I am totally in love! Here is a step by step tutorial on how to create little minions painted with nail polish on your nails. I could totally see this as a fun activity to do with some little girls. Despicable Me Pancake Breakfast– This idea is so awesome! You can make a sweet breakfast out of pancakes, eggs, raisins., marshmallows, and fruit roll ups! She made the food look like the characters in the movie. Despicable Me Candy Spoons– I love this idea, it is so easy and yet so brilliant. This women made minions out of plastic spoons! She just dipped them in yellow candy and drew on the faces. 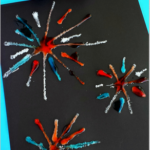 These make great party favors for kids after they dry. Despicable Me Birthday Cakes– Find tons of pictures of minion birthday cakes! There’s even a funny nurse one. 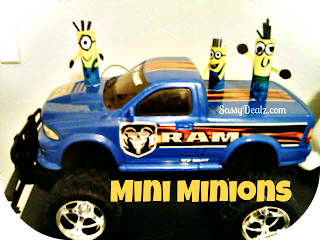 Scrambled Egg Minions– Cool! Make a minion’s body out of yellow scrambled eggs and make the overalls with blue go gurt! Minion Banana Yogurt Pops – If you have bananas in the house consider making these adorable minion banana yogurt pops. This lady gives you step by step instructions on how to put your minion together! Minion Marshmallows on a Stick– These are too cute. All you need is big marshmallows, a stick, yellow candy melts, a blue fruit roll up, and candy eyes. You literally dip the marshmallow into the yellow candy which makes the minions big head! Despicable Me Fruit Tart – Make a minion out of blueberries, bananas, raisins, and cut up mangos. YUM! DIY Minion Push up Cupcake Pops– These would be great for a birthday party! 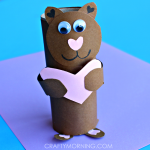 Print off her templates for a wrapper, and fill some push up pop containers with some cupcakes.